Since starting the doodles in my 6″ x 6″ sketch book, to travel with ,I have become immersed in continuing with a Series using a CD as a starting point. I have to do one as I wake up and can’t settle to sleep at night without doing another. And today I got some Posca Pens in the post! they show up so well on the black card – they sort of glow! Not cheap at £14.99 for 8 pens but so worth it. I am on my second sketch book – they each have 40 pages in them …. Must go – I have doodles to doodle doodle doo! Last week there was an Inset Day at the school so the boys, Big Bro 7 and Little Bro 5 came to me. They absolutely LOVE playing drawing consequences – I expect you know the game .. but just in case you don’t I’ll describe it. Tear A4 paper into half, lengthways. Each person has a strip of paper. Without showing the others, draw a hat at the top of the paper and then fold the paper over to hide the drawing except for a couple of lines to show where the face should go. The papers then get passed to the next person. Everyone draws a face and folds the paper again, leaving the lines of the neck showing. Next the body is drawn, leaving lines for the placement of the legs. The legs are drawn leaving lines for the feet. Five lines are put at the bottom and the paper is passed round for one letter to be added in any space at each turn. This will create the name of the character. Then we all open the paper and laugh at what we have drawn, and try to pronounce the names. We usually have to play at least 4 rounds before they want to move on to something else. Next we hid our names in a secret design. In pencil, draw a central line and write your name in clear bold letters, touching the line. Turn the paper round and draw a mirror image of each letter, touching the original letter. Turn the paper so that the first letter is at the bottom of the page as in the picture. With a pen or crayon, start to pick out lines and features to make a symmetrical pattern. The idea is that the pattern looks like a design, it is only when it is held sideways and the right way up that the name can be seen. Or you can just continue creating the design until the letters are entirely obscured. 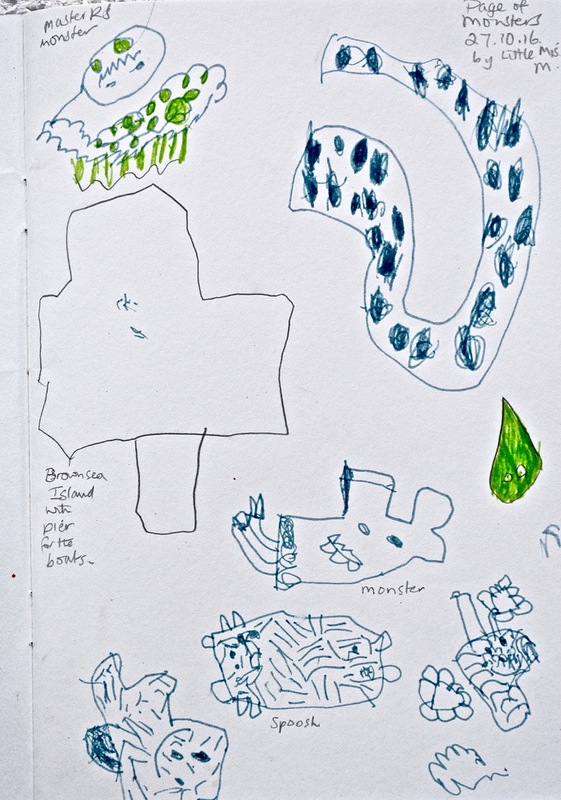 Pictures drawn on the ferry ride back from Brownsea Island last week. All drawn by Little Miss M, aged 4, apart from the one top left, by Master R aged 7. To join in with the Photo Challenge or the Phaiku Challenge which combines the two challenges, please leave a link in the comments. Last week Miss E and I went on the train to the Lymington Museum and Art Gallery where 22 Home Schooled children gathered to take part in the most wonderful workshop based on an exhibition of work by many different artists all creating pictures of trees. The children were invited to leap into a painting and imagine themselves there – what could they hear, see, touch, smell. What would they need to take with them. how did they feel whilst they were there. They then chose a painting to look at for 10 seconds then turn away and draw from memory, then a different painting to draw just the outlines for 5 minutes, then 5 minutes to use colour. After that we went to the craft room to create a printing block of their drawing in polystyrene, to print on coloured paper. On the train I was allowing the movement of the train to create wiggly lines in my sketch book as a quirky diary/memory of our day. I just LOVE the way her creative mind flows. Ronovan’s Weekly Haiku Challenge, prompt words: REIN and QUEST. I’m a little late this week as I have been away for a few days visiting my son and his three girls and then to Chelsea Flower Show with my sister! We had the BEST time – more of that soon. A highlight of the day was meeting up with fellow blogger Dorris – Wow! That was really special!